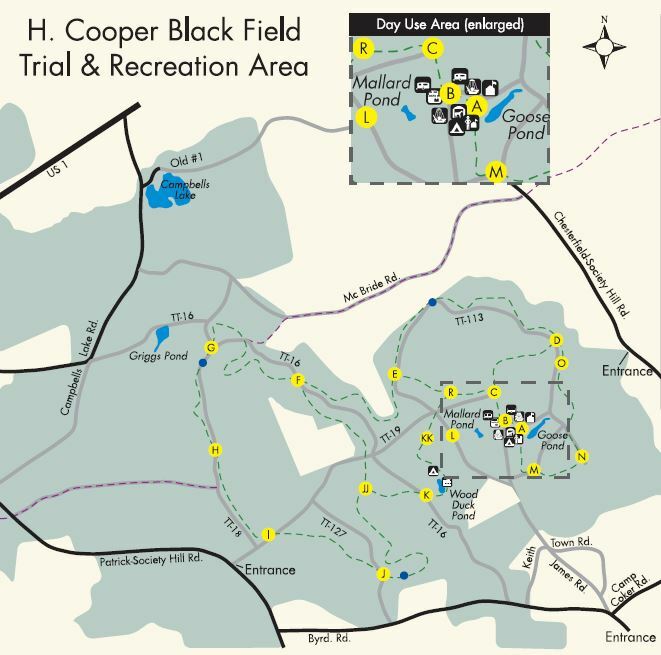 Covering 7,000 rolling acres of longleaf pine forest and fields, the H. Cooper Black Jr. Memorial Field Trial and Recreation Area is the setting for national-level field trial and retriever competitions. In South Carolina, horseback riding is a popular activity, and this park is one of the most equestrian-friendly, with more than 20 miles of trails and sand roads offering top South Carolina horseback riding and an ample number of equestrian facilities including stables, kennels, corrals and arenas. H. Cooper Black camping sites, complete with water and electrical hookups. Camping Reservations: Please contact the park from 11 a.m. to noon, daily, at 843-378-1555 for camping reservations and information. Fees: fees for day use, Fees for campers. From Bishopville: Drive north on SC 341 to Bethune. Turn right onto US 1 and drive to Patrick. From Patrick drive 6.5 miles and turn right onto Chesterfield­/Society Hill Road (S­13­20). Drive 4 miles and turn left onto a gravel road. The trailhead is in .2 miles.